People have been found to experience issues like back pain and other complications due to improper posture while sleeping in this position. Thankfully, there are some pretty nifty inventions in terms of better pillows for side sleepers out there that allow them to sleep deeper and safer without having to worry about a backache in the morning. There are scientists and researchers in universities around the world who conduct sleep studies to find out which are the best ways for people to sleep without additional muscle and joint problems occurring. Some of their inventions have been incredibly effective. 1 What Is The Best Pillow For Side Sleepers? 4.3 What Are The Different Types Of Side Sleeper Pillows? The best pillows for side sleepers are made to fill out the gap that your head and bed have between them. This means that your body is always going to be aligned in the ideal sleeping position. The thickness also matters with these pillows, as well as how firm they are. If you choose one that is too soft or too thin, you are going to be in trouble, as it will fail to keep your head perpendicular to your shoulders. Any bend in your neck is going to affect you in an adverse way over time. If you pick a pillow that is gargantuan, you are going to be in trouble as well! It will bend your neck in the opposite direction. This is a guide to help you pick from the cream of the crop, as we review some of the best pillows for side sleeper out there on the market right now. If you don’t have one already, make sure you pick one of the recommended products up and make use of it! 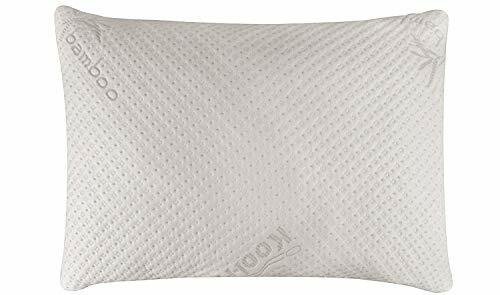 This has been rated as one of the best pillows on the market for people who tend to sleep on their sides or even on their stomachs. It is described as being heavy duty, and has the capability to put a neck in the best position for comfortable sleep. While firm, it is also soft and plush, meaning that it feels incredibly comfortable no matter who is sleeping on it. It has an inner, high quality memory foam core, shredded for extra comfort, breathability and increased heat dissipation for cooler sleep. The foam is hypoallergenic and repels mites. The cover that comes with this pillow has been derived from naturally occurring bamboo. It increases how cool the sleeper is kept, and tends not to absorb and retain sweat and other moisture. The cover is machine wash compatible and is easy to use. The manufacturer is rather well known in the US, meaning that services and warranties are easy to claim. Complaints are dealt with pretty fast as well. There is a no questions asked guarantee for returns. The pillow itself is firm and comfortable enough to give great back and neck support. The foam that forms the core of the pillow is easy enough to shape into the space that is between the ear and shoulder. People who sleep with an arm under the pillow will find out that they can finally relax because of the moldable foam core of this pillow. It is firm enough not to flatten out over time, and will not lose shape overnight either. This pillow comes with a guarantee to never flatten out. It is made out of shredded memory foam of the highest quality. It is easy to mold into different shapes, provides a high level of comfort and incorporates airflow for added cooling. It is different to solid pads of foam in that it provides all of the support without any of the stiffness. The shredded foam bits mean that it adapts to the position of the sleeper far easier. It is incredibly versatile, and comes in a larger queen size for the perfect body pillow. The thick, plush pillow is perfect for people sleeping on their sides, but it can be used for any type of sleeping. The thickness means that you won’t need to fold your old pillows in two anymore to get the extra thickness you need while destroying their fluffiness and shape. The pillow also comes with a warranty that lasts for an outstanding 20 years, and the company provides a high level of customer support after sales are completed. It is also biodegradable and environmentally friendly. Pregnancy support – This pillow is great for supporting you when you are pregnant and havng a hard time getting comfortable in bed. The foam is tough enough to provide the right kind of support for back and abdominal muscles. It also reduces the strain placed on your hips, back and shoulder. Air cool technology – The fabric on the outside is bamboo, and the cover is vented. The foam is also shredded. All of these make for an extremely well-ventilated pillow. This is really important because the sweat buildup inside a pillow can lead to the breeding of bacteria and mold, causing allergies and diseases. This is negated with this pillow because of the ventilation, leading to healthier sleep. Trial period – This pillow comes with a 3 month satisfaction guarantee. If you aren’t happy with the pillow at any time within the first 90 days after purchase, you can send it back and receive a full refund. Add this to the 20 year warranty that allows you to get a free replacement, no questions asked, and you have yourself a great pillow! This is a pillow that comes from a highly reputed company. This means that you can almost be guaranteed of getting a high quality buy. The foam used is environmentally friendly, and certipur certified. This means that it doesn’t have chemicals releasing that can deplete the ozone layer, and that it is free of toxic metals like lead and mercury. It also has zero emissions, and is fire retardant without having any toxic chemicals in it to facilitate this. This certification means that the pillow is extremely safe, which is a huge bonus coupled with its other features. It also features an outer bamboo derived case that is easy to maintain, eco-friendly and renewable. It provides good heat dissipation. Supportive form takes away restlessness during sleep, meaning it provides deeper, sounder sleep. Plush support tech makes this one of the best pillows for side sleepers out there. It supports the neck and shoulder extremely well. Shredded foam moves around allowing for better adaptability to changing sleep positions throughout the night. Larger sizes are available for use as body pillows, for back and stomach support to maintain posture while side sleeping. 5 year warranty with a satisfaction or money back guarantee from Good Life Essentials. Learning curve – memory foam requires some getting used to, especially when it comes to care and prep before use. Bad odor during first use – cleared up by airing it out for a few hours. Strange feeling to get used to for people used to standard cotton pillows. Not great for switching up positions – the pillow doesn’t flatten out meaning you will always have to use it on your side. Some people prefer the softer, more natural feel of a feather pillow than the thick, firm feeling of sleeping on memory foam. 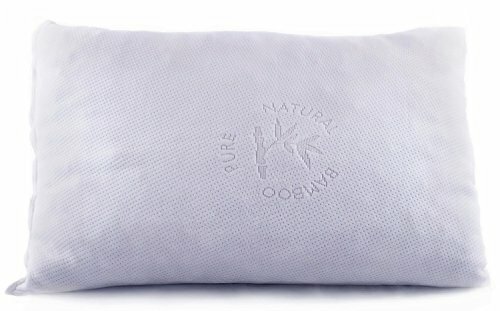 This is one of the best alternative material pillows for side sleepers out there. The core is made out of synthetic down fiber. The good thing about synthetic fiber is that there isn’t the risk of having an allergic reaction to the feathers like some people usually do. The feathers don’t wind up poking out of the pillow and pricking you either. It has a wide profile and is thick enough to provide good support for the sleeper. It is also versatile enough to accommodate stomach sleepers in addition to side sleepers. It can flatten, but not completely. Soft and clean – down is usually a material that gets dirty fast. The synthetic version is far cleaner, and is thick enough to give extra support. However, it is also soft enough to provide great levels of comfort. Body fitting – The sides of the pillow are 25 inches long, allowing for great support for the back and stomach during sleep. It can help a fidgety person keep in one place at night without spraining something in their sleep. 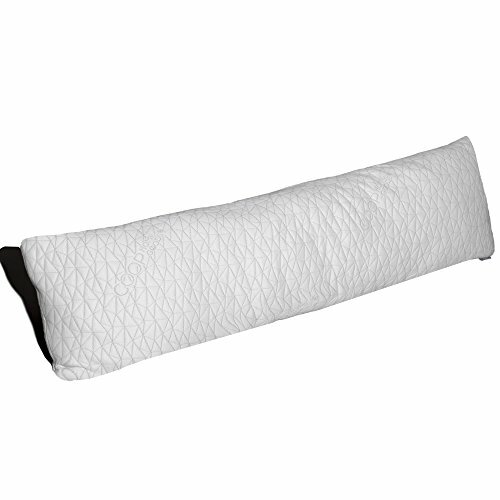 This is one of the most supportive pillows for side sleepers out in the market. It has a soft, firm inner core that is resistant to bending and twisting. It allows for great support all night long. The inner core is made of spiral spun polyester and foam. The outside is padding with microbeads inside it. The microbeads are made of PCM for automatic adjustment to body temperature, allowing for the most advanced temperature regulation ever. PCM is another term for Phase Changing Material, which is a type of material capable of detecting the temperature and changing its molecular structure based on this feedback. Hard and stiff – right when unboxing, it feels like a concrete slab. This passes after an initial fluff. Sleeping is something that every human needs. We can’t live without sleep. This is entirely literal, as the lack of sleep can lead to sudden brain death. You have to get your rest as much as you can and as well as you can in order to maximize productivity throughout your day and avoid unnecessary health issues. Now, people have devised a huge amount of different methods to use in order to sleep better over the years. Most of these are able to adapt to the different ways in which people sleep without a problem. There are now pillows for side sleepers as well as back and stomach sleepers. Your sleeping position is actually a major contributing factor to the depth and the level of comfort with which you sleep every night. Over time, you can get into a routine that can be uncomfortable but also hard to crack. There are pillows out there that are made so that they will force a side sleeper into a better position by blocking access to the worse positions during sleep. These are lauded by a lot of people as being the best way for people to deal with the problems that sleeping on their sides brings at times. There are, however, different types of side sleeping as well, each of which has a different effect on the body over time. For example, you could be the type who sleeps on your side with your arms pointing straight down. This allows you to maintain a good natural sleep position with a slightly curved spine. However, sleeping on your side isn’t all puppies and marshmallows. If you get too used to sleeping on your side, you are actually going to be more prone to the sagging of the skin, as well as to a more restricted blood flow in your arms and shoulders because of the way your body presses down on them. The chances are that you won’t get any sleep that night. When it comes to pillows for side sleepers there are many different kinds out there. Any one of these are going to be good enough to satisfy you on a psychological level. Now, it isn’t enough to just buy a random pillow and try to sleep on it. You need to have a general knowledge of the types of pillows out there and which type suits you the most. You have to remember that a pillow isn’t a baggy t-shirt that fits anyone who wears it. You have to take the way you sleep and choose a pillow that’s going to fit that style of sleeping. You can talk to an expert if you aren’t sure what kind of pillow you need to be getting. If you haven’t been using the right type of pillows until now, you probably have experienced the side effects. Ever wake up with that crimp in your neck or shoulders? That’s the wrong kind of pillow you have been using. Sure, your position contributes to it, but your pillow has the capability to take the pain away if you choose right! A lot of the types of pillows on the market are manufactured and designed to be pillows for side sleepers because these are the most common type of human out there. One of the most important things is for you to know that your weight has been dealt out evenly, and that the space between your ear and outer shoulder is filled up with a pillow. Because of the need for the head to basically be propped up by the pillow, it is always best to pick one that is firmer than the rest. Pain at random times during the day is quite common for side sleepers who don’t use the right kind of pillow. When there is undue strain on the neck for many hours every night, it is only common sense that your body is going to be pretty strained when you wake up. This can lead to pain, numbness and headaches. This is why you need pillows for side sleepers as soon as possible: so you can sleep right and sleep tight. When buying a new pillow, give it a test drive in your favorite sleeping position so you can know for sure that you are comfortable with it. This is pretty obviously the main reason you even buy a pillow, right? Well, there is actually one other thing you need to be thinking about. This is even more important than the comfort provided by your pillow, and it is the quality with which the pillow supports you at night. Side sleepers absolutely need support added on for their necks in order to prevent muscular and skeletal aches and pains. If you sleep on your side instead of your back or even your stomach, your head is going to have a little more space between it and your mattress. You need to make sure that this space is filled with something solid, so that your head remains straight. This allows you to make sure your spine isn’t unnaturally curved. If this isn’t done, the head bends weirdly towards the mattress, causing your tendons in your neck to stretch and come under a lot of strain. When you do decide that you need to buy one of the best pillows for side sleepers you are finally on the right track. However, this isn’t an easy task. In fact, choosing from the hundreds of different brands and designs is going to be pretty hard. There are great pillows out there, but there are also some pretty terrible ones. If you pick the wrong one, your condition can actually worsen, turning you into someone who is allergic to life in general. Make sure you choose wisely, or you risk turning into a victim. Why do you use a pillow? Well, from a medical perspective, it is so that your head isn’t in free-fall when your go to sleep. Your head should, in an ideal situation, be at right angles to the line of your shoulders. This means that your neck and head have to form a straight line together, without your neck being bent in any way at all. If you are a side sleeper, keep in mind that the ideal pillow for you is going to be firmer and thicker than what a back sleeper or a stomach sleeper would get. The reasoning behind this is simple: there is more space between your head and your mattress, meaning you need more cushioning to fill the space. This being done, there is also a need to support your head in this straight, comfortable position all night long. Look for loft. This is the height that it reaches to, or thickness of the pillow. Make sure that it doesn’t have so much height as to bend your neck upwards, or so little as to bend it downwards. Make sure that it is the perfect height for aligning your head with your neck. Firmness is important. Make sure that it fills the space between the bed and your ear, but ensure that it is firm enough to support this. It will be completely useless if it collapses and depresses the second your head touches it. Trust your gut. Sometimes, you are just going to have a really good feeling about a certain type of pillow. If this happens to you, it may be best to go with your instincts. Your intuition can tell you more than the store staff can. Another quick tip you could follow is to buy yourself a body pillow. This is another of those innovative pillows for side sleepers that will support your back or your stomach to prevent you from rolling over and twisting your neck, as this could constrict your windpipe and restrict your breathing. When picking this type of pillow, look for the most massive one in the store. Something king or queen sized will be perfect, although a normal size also does the job. As you go to different stores and check out the pillows they have in stock, you are going to find that they have a ton of different options available. Some of them are designed in a very specific shape, whereas others are more adaptable. Remember that while you may be someone who starts off on their side, a lot of people shift to their backs or stomachs during the night. A more malleable pillow may be the right choice for you if you wake up on your stomach instead of your side in the mornings. There are a couple of other tips you can follow to make it easier to choose a better pillow. Test it out. You simply can’t test drive a pillow if you are in a store, whether it is physical or online. However, a lot of good manufacturers and retailers will allow you to take the pillow home for one night and try it out. They offer this service with a full money back guarantee, so make sure you take advantage of it. There is nothing better than trying it out in your own bed to know if it is the best fit for you. Adjustability. A lot of the pillows out there aren’t adjustable. They come in single sizes that can’t be changed. However, some models have a zippable opening that allows for material to be stuffed in or taken out based on your own needs. This means that as your style of sleeping changes, you can change the loft and the firmness of the pillow as you need. What Are The Different Types Of Side Sleeper Pillows? 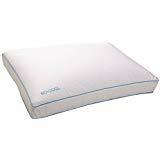 Memory Foam: This is a pillow that has a lot of contours and smooth edges in its shape. It is perfect for additional support for side sleepers. One of the best parts of this type of filling is that it has a tendency to retain its shape over extended periods of time. In fact, the average memory foam pillow will work well for at least 2 years, and maybe more. Because it is contoured, it allows for great head and neck support while offering better weight distribution of the body and helps to regulate your body temperature too. Feather Filling: This is another type of pillow that allows for much better support for the side sleeper during the night. It is filled with naturally occurring feathers, meaning that the natural fibers allow for a far higher level of comfort than synthetic fillers. It is incredibly soft, meaning that it won’t force the face to be squashed against it and therefore restrict circulation in the cheeks. It also means that those unsightly lumps don’t press into your pressure points on your neck, meaning that it provides the highest level of comfort when it comes to pillows for side sleepers in the current day. Keep in mind though that the lifespan of this pillow type is low. It can actually run for a maximum of two years before it collapses and becomes redundant. With improper care, this could last for a way shorter time. Buckwheat Filler: These are pillows that are made out of naturally occurring materials, just like their feathery cousins. However, they are made out of buckwheat shells, which can sound a little weird. If you are against feathers and fur, this might be right for you. 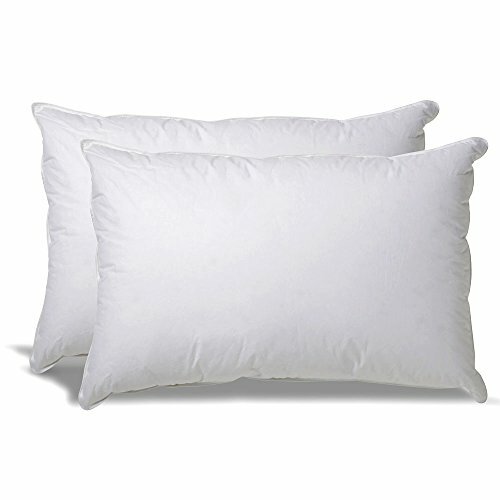 These pillows are firmer than feather pillows, meaning that they don’t collapse after constant use. They are also very good at dissipating heat, meaning that people who don’t want to feel stuffy at night should use this. It is a good type of pillow for regulating the temperature of the body during sleep. Of the problems is that the buckwheat shells can weight a lot compared to typical pillows. In fact, it is quite common for the average pillow to weigh up to 5lbs. Latex: Latex is becoming increasingly popular as a filler for pillows. It is a completely synthetic material that provides greater support than typical down and feather pillows. It doesn’t collapse over prolonged use, and is more resistant to wear and tear. However, latex is a relatively expensive commodity compared to the rest. It is still an emerging material for pillows for side sleepers and is therefore rather pricey. However, it is a worthwhile investment, mainly because it lasts for up to 5 years and even more based on the quality and reputation of the manufacturer. As you shop for pillows, you will see some with different materials, shapes, designs and functions. They are invented for people who sleep on their sides, backs and stomachs. Always stay wise when you are choosing the right type of pillow for you. For a few examples of really good pillows, here are some unbiased reviews of the best pillows for side sleepers on the market right now. As you browse this site, you will read about the many kinds of pillows available on the market currently. Some of them will stun you, others will awe you. Remember that what matters in the end isn’t just your comfort in the short term, but in the long term as well. Pick support and comfort in the perfect balance.